We humans often don’t even know we are doing it, worrying and stressing about stuff that we, in fact, have no control over, somehow the concept of control is difficult for us to comprehend we strive automatically to be in control of everything, which in reality is very false information. Perhaps that is the key component to why we actually worry so much, we fear not having complete control over everything and anything. Dwelling, agonizing and overthinking what we perceive as our troubles and difficulties is quite simply a loss of time, energy and effort. We think we can control our future, or at least we try very hard to have the upper hand even though often our gut feeling tells us that nothing is ever engrained in stone. Uncertainty is a word we fear as much as death it can give way to unease and anxiety, tormenting our self is something we are all very good at, we began to inherit this behaviour from a very young age. Ending the habitual cycle of distressing our mind and physical body takes a tremendous amount of courage but bravery is available naturally to us if we would just let our guard down long enough to feel and become familiar with it. Could we compare our life to a 1000 piece puzzle, would this analogy feel correct? If we are trying to put a puzzle piece in the wrong place it’s just not going to fit, if we are forcing something in our life to work and the Universe has other ideas for us, whatever it is we are trying to influence with our will at the end of the day it just isn’t going to work regardless of how much we try to push it into place. 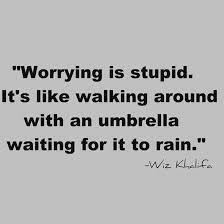 Worry can wear us down often to the point we might feel like we are going a bit crazy, we invest so much energetic force into our thinking patterns that surely one day what we have been storing in our worry container will eventually explode. A day will come when you can’t keep your built up fears inside of you any longer and something will have to give. We all have a breaking point and the Universe waits patiently for what will eventually crack us open. Once we are ready to let go we are truly ready to become more conscious and grow. Have you nearly reached your breaking point, if so, congratulations your Soul has worked tirelessly to get you to this place?